After pickup from your downtown Toronto hotel/residence, enjoy a 90-minute drive to your first stop, an award winning Niagara Winery. Here, you'll stop for 30 minutes to enjoy a private tasting with certified VQA Wine technicians. Sample red, white and world famous Ice Wine. In addition to your tasting, the winery also features a market with fresh fruit, maple syrup, cold drinks, picture opportunities, and clean washroom facilities. For any passengers wishing to abstain from alcohol, you are under no obligation to sample wine. Non-alcoholic alternatives are provided. Next up is the historic and charming town of Niagara-on-the-Lake. This town is the site of the War of 1812 between the British and the Americans. Present day it best serves as the "sweet tooth" capitol of Canada! Indulge in fudge, cookies, scones, ice cream, sausage rolls, cinnamon buns, coffee/tea, and so much more! On this 45-minute stop of the tour, enjoying your snack and learn important history about Canadians, Americans and the British. If history is not your strong suit, enjoy the town's many shops and fascinating architecture. Afterwards, sit back and enjoy a scenic drive along the Niagara River Parkway with its beautiful houses, gorgeous vistas and dozens of wineries. Along this route, stop for photos at Floral Clock, a large 40 ft. clock formed by a magnificent design of seasonal flowers. You can also make a wish in the fountain! Other stops along the Niagara River Parkway include the Hydro Power Station and the Niagara Gorge & Whirlpool Rapids. 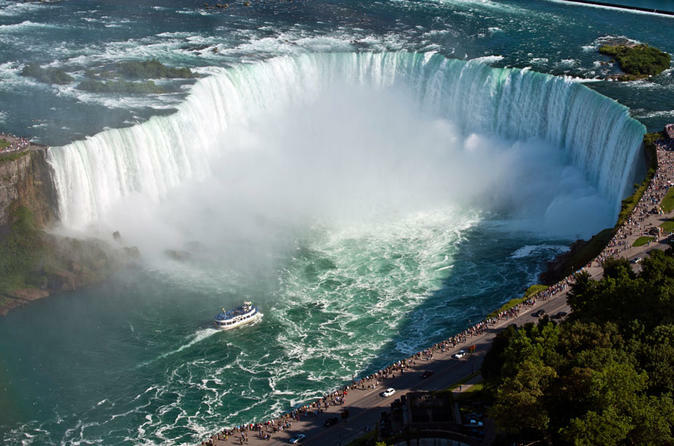 Stand on a viewing platform that jets into the 12,000 year old Niagara Gorge. Here you can witness Class 6 rapids reaching maximum speeds of 45km/hour and the world's largest natural whirlpool. At this stop, your guide will offer an important geology lesson outlining the power of erosion! This location is the best spot for a once-in-a-lifetime photo atop the platform. You'll arrive at the Falls between 12pm and 1pm. Here, enjoy a 40-50 minute tour that includes the world famous Hornblower Boat Cruise. This is the highlight of the tour! Hop aboard a state of the art catamaran and head directly into the base of both the Canadian Horsehoe Falls & American Falls. Feel the power of the mist and rushing waters surrounding you. Your tour features line bypass to ensure a smooth experience. The Hornblower is wheelchair/stroller friendly and 100% safe. After the boat cruise, you will have 2 to 3 hours of free time on your own to enjoy lunch, attractions, casino, pictures, and shopping at the falls. You'll then depart Niagara before 4pm and arrive back in downtown Toronto before 6pm. Please note: The tour offers front-door pick-up and drop-off at your airport or downtown hotel/residence.